One of the lovely things about the whisky industry is that you get to meet people spread all over the world. My semi-frequent visits north of the border mean that I know a bunch of people around Edinburgh and one of those is Mark Davidson of Cadenhead’s, my travelling companion for the 2013 Victoria Whisky Festival. He runs the Jolly Toper whisky tastings in Edinburgh, and I’ve been annoyingly good at missing them whenever I visit. However, with my biannual pilgrimage to my family’s timeshare cottage in Aviemore on the horizon I decided to start my journey north a few days early and stop in at a charity tasting that Mark was running. The tasting was in aid of Marie Curie Cancer Care, a charity that supports terminally ill people and their families. As a thankyou for the care that his family had recently received Mark is running some tastings and events in Edinburgh to raise some money for the charity. Along with the tasting I attended he’s also got another running in March and an auction for a bottle of Highland Park St Magnus – you can find out more over on Mark’s upcoming tastings page. Mark runs his tastings in a similar manner to Whisky Squad, tasting everything blind and focusing on chatting about the drams rather than anything more formal. We had five drams on the mat and with little preamble dived straight in. The first whisky had a nose of orange oil, garibaldi biscuits, ground almonds, brown sugar, leather and a touch of fruit, but was lighter than that description sounds. To taste that lightness was evident, with the whisky being thin, sweet and quite obviously grain heavy. It had cream, Golden Syrup and a touch of smoke, with liquorice (Pontefract cakes? ), apple skin and custardy hints. It finished with a touch of gravel, green leaves, more cream and a lingering afterburn. 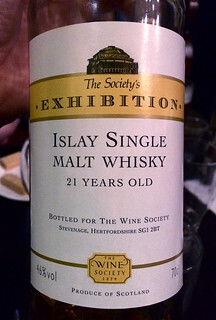 The second dram had a light and spirity nose, with glue and nail varnish backed up by sweet caramel and toffee popcorn. To taste it continued the sweetness, with vanilla and brown sugar, wood polish, a touch of lemon and some woody spice. It finished abruptly and uninterestingly on first sip, but as I worked my way through the glass I got a bit more each time, with oak, spice and sweet cream appearing, along with a touch of heat. We discussed this a bit and guessed that it was a grain. I was fairly certain that it was Scottish but there was talk around the table that it might be Canadian, not that unlikely as I find decent Canadian whisky to be similar to Scotch grain. 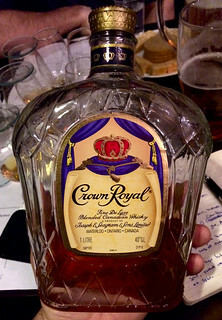 Mark pulled the bottle out to show that it was Canadian – Crown Royal, complete with purple bag. Increasingly hard to find in the UK and one that I might have to grab instead of a everyday Scottish grain. Whisky three had waxy wood polish up front on the nose, with ginger nuts and a floral background – honeysuckle and violets. It also had a bit of meaty weight. To taste it was waxy with digestive biscuits, black tea leaves, gentle spice, milk chocolate touches and a lick of smoke. It finished with damp oak, rich earth and sweet tea, with some polished wood also hanging around. This one was a little easier to pick out, and we narrowed it down to at least ‘something in Scotland’ with my guess being Clynelish – waxy with a bit of smoke? Pleasingly I was right, and this was the most recent release of the Clynelish 14yo, which has had a bit of an upgrade in packaging and colour in the last year, and a generally accepted tweak to the flavour profile. It tasted pretty similar to the previous edition for me, but the main thing I remember is that I liked the old one, and I liked this one too. Whisky four brought some sherry to the table, which was much appreciated by the room. On the nose it was leathery, with peppery spice, rich earth and smoky hints, and a balancing sweetness underneath all that. To taste it had soft sherry cask notes, with pastry, apple tarts, cinnamon and nutmeg, dark chocolate, brown sugar and liquorice, although much lighter in body than that suggests. It finished with pepper, spice, dates and a touch of lingering barrel char. Our final dram of the evening added a bit of smoke to proceedings, with a nose of sweet peat, coal smoke, rock pools, brine, fruit and a gentle floral note. To taste it was fruity, with lemons and melons, apples, orange peel, floral touches, a bit of cream, barrel char and gentle smoke. It finished with charcoal, the mixed fruit from the palate, some woody spice and a bit of an alcoholic tingle. The floral hints gave it away to my table, and we guessed correctly – Bowmore. It was a Bowmore 21yo bottled for the Wine Society at 46%. I’ve not tried anything from them before and rather liked this one – at the end of the evening I was one of the two people bidding for the end of the bottle. I lost, but Dennis, one of the guides from Glenkinchie, was a generous winner and shared it around. 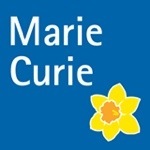 Anyways, a great tasting evening which picked up a nice chunk of cash for Marie Curie. If you’re interested in donating a few pennies then head over to their website, or pop over to the Jolly Toper Facebook page and have a bid in his Highland Park auction. @cowfish @BillysBoozeBlog @mariecurieuk what is it about tasting bowmores at the end of a session and then having to own them? Alastair White liked this on Facebook.